The DoD Unified Facilities Criteria (UFC) program developed documents to assist in determining the design basis threat and the desired level of protection of structures. Determining the level of protection to be achieved by a building against an explosive threat can be complicated and is based on analysis that considers variables such as the value of assets inside the building, likelihood of aggressor attack, aggressor tactics, and threat severity. An engineer designing for Antiterrorism (AT) must have an understanding of how to perform a blast analysis. 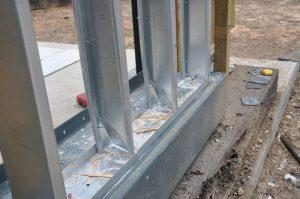 The focus of this article is blast protection of exterior cold-formed steel framing (CFS) in the building envelope with controlled perimeters subject to air blast.